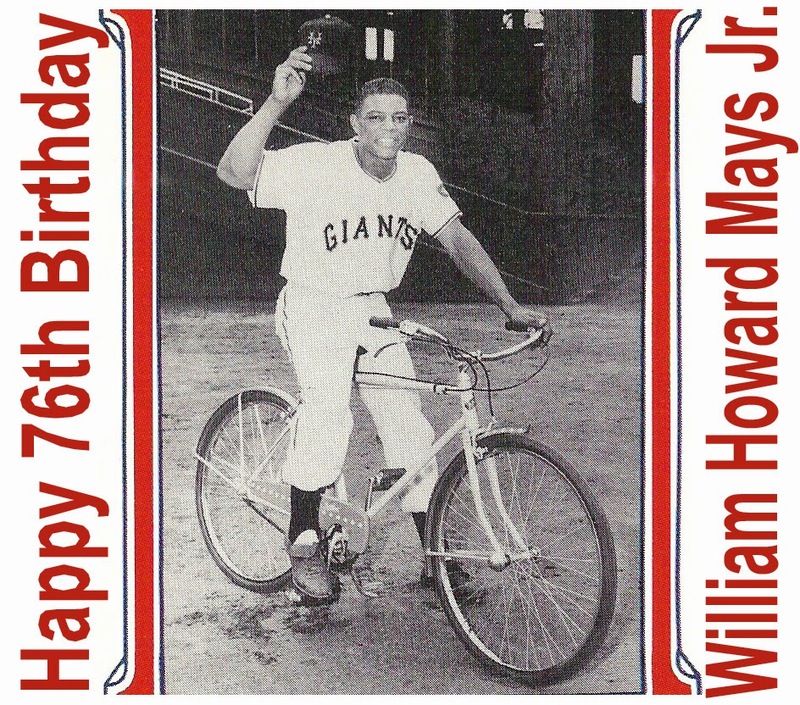 San Francisco Giants fans are familiar with all the great feats of baseball legend Willie Mays. They know he hit 660 career home runs. They know he made "The Catch" in the vast Polo Grounds outfield during the 1954 World Series that fueled the New York Giants to a championship. They know "The Say Hey Kid" was perhaps the best all-around baseball player to ever play the game. But beyond the dazzling catches where the outfield wall played victim or the tape-measure homers, there are some thing you might not have known about the Hall of Famer. Mays is the only player to ever hit a home run every inning from one to 16 throughout his career, according to the Society for American Baseball Research. Here's the Society's inning-by-inning chart. His 16th-inning home run came on July 2, 1963 at Candlestick Park against Milwaukee Braves starter Warren Spahn (yes, Spahn started the game and pitched 15.1 shutout innings). Mays' solo-shot was a walk-off, and the Giants won 1-0. Giants starter Juan Marichal pitched 16 shutout innings in that game. Mays' first big-league hit was a home run off Spahn too, when the Hall of Fame pitcher was playing for the Boston Braves. Mays went hitless in his first 12 career at-bats, until May 28, 1951 when he hit a home run at the Polo Grounds. Spahn later joked, "I'll never forgive myself. We might have gotten rid of Willie forever if I'd only struck him out." And he still hasn't gotten rid of Willie. He can be seen today frequenting AT&T Park. And don't forget about the statue forever memorializing the Giants' great outside the ballpark. Willie Mays may have become more humble in his later years, but not during his Hall of Fame induction ceremony in 1979. When he was asked whom he considered the best player he ever saw when he played, he said, "I don't mean to be bashful, but I was." And he was probably right--and still is. Stats and info from ESPN, Baseball Almanac, and "100 Things Giants Fans Should Know & Do Before They Die" by Bill Chastain. Follow Vince on Twitter @vintalkingiants. Questions or comments? E-mail my blog mailbag at vince.cestone@yahoo.com. Your questions may be answered on my blog. The San Francisco Giants' historic 2014 postseason run ended with their third World Series championship in five years, the first National League team to accomplish such a feat since the St. Louis Cardinals from 1942-1946. Winning the 2014 title was probably the most difficult of the three. They had to endure an 18-inning game on the road in Washington, a Cardinals team that never quit, and a Cinderella-story Kansas City Royals team that pushed the Giants to Game 7 of the World Series. Not to mention, the Giants had to make a run without their leadoff hitting catalyst Angel Pagan and with a rookie starting at second base. Their postseason horse Matt Cain was out for the season in July and every starting pitcher not named Madison Bumgarner struggled to make it to the sixth inning throughout the postseason. But the resilient Giants still found a way to get it done, with their hard work rewarded with a parade down Market Street on Halloween. From Bumgarner's complete-game shutout in the Wild Card Game in Pittsburgh to Pablo Sandoval's catch on a foul-ball popup to wrap up the World Series, the Giants had their fans on the edge of their seat all October--torture and all. 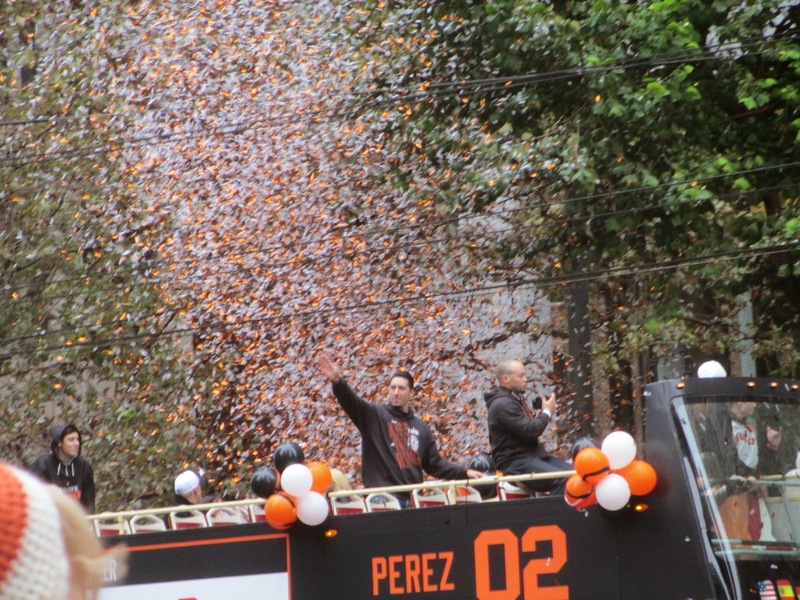 For my top five moments from the Giants' 2014 championship run, check out my article on NBC Bay Area. The Giants were six outs away from heading back to St. Louis in the National League Championship Series up 3-2, missing a shot to clinch the pennant at AT&T Park. But Michael Morse, who was injured for a month with a strained oblique and relegated to pinch-hitting duties, did not want to pack his bags that night for the Midwest. Your browser does not support iframes. The Giants did indeed pack their bags for Missouri, but it was to play in the World Series in Kansas City, as Travis Ishikawa brought the pennant home to San Francisco one inning later. The Giants were dead in the water in Game 2 of the National Division Series. Washington Nationals starting pitcher Jordan Zimmermann threw 8 2/3 shutout innings and was just one out away from beating the Giants 1-0. But a two-out walk to Joe Panik prompted Washington skipper Matt Williams to go to his closer Drew Storen. Buster Posey singled off Storen, leaving it up to Pablo Sandoval as the Giants' last hope in Game 2. Your browser does not support iframes. Although the Nationals gunned down the lead run Posey at the plate, the Giants tied the game at one in dramatic fashion. Nine innings later, thanks to a clutch home run by Brandon Belt, San Francisco closed out the longest game in postseason history and was up 2-0 in the best-of-five series. Pence's catch at the right-field wall proved to be huge, as the Giants won the game 3-2. Had Werth tripled, the Nationals may have rallied and the series could have shifted to Washington tied 2-2. But thanks to Pence, the Giants advanced to the NLCS with a Game 4 win. These three moments did not make my top five, but having too many top postseason moments is a great problem to have. The weirdness of the 2014 San Francisco Giants season continued Wednesday with two instances serving as a microcosm for the season. The Giants had their ups-and-downs all season. Fans know all about the incredible record to start the year, followed by a dead-ball-era offense from June on. But Wednesday's Wrigley Field tarp fiasco (and it's eventually outcome) and disappointing news on first baseman Brandon Belt illustrate how when something good happens for the Giants, something bad always seems to follow. With the Giants losing 2-0 to the Chicago Cubs in the middle of the fifth inning, a heavy downpour littered the field in Chicago and the game had to be stopped. After the Cubs' grounds crew made a mistake and could not cover the entire infield during the 15-to-20 minute downpour, umpires deemed the infield unplayable and called the game official--Cubs win 2-0. Keep in mind, the only reason the Cubs had the win was because of a rare mistake from the Cubs' grounds crew--with no malicious intent--on something they do at least 10 times a year. But then, like Michael Morse's recent hot streak and the Giants' 3-2 homestand last week, San Francisco had reason to stay sane. After the Giants protested the game on a loose interpretation of mechanical tarp failure as stated in Rule 4.12(a)(3), Major League Baseball agreed with them, and the game will be resumed Thursday at 2 p.m. Pacific Time. As rare as the tarp malfunction was, the last upheld protest was 28 years ago, when the Pittsburgh Pirates claimed umpires did not wait the minimum amount of time before calling the rain-shortened game a victory to the St. Louis Cardinals. This is just the 15th time in baseball an upheld protest resulted in a resumed game. This is great news for the Giants because they have to like their chances against the Chicago Cubs' middle relief. Although they rank seventh in the National League in bullpen ERA, the suspended game gives San Francisco four innings to come back two runs against somebody other than the tough Tsuyoshi Wada (2-1, 2.75 ERA). And that somebody, according to Gordon Wittenmyer of the Chicago Sun-Times, is 4-7 with a 5.80 ERA--Jacob Turner. Recently acquired Jacob Turner to get ball for Cubs when Tuesday's game resumes Thursday. Brandon Belt, who led the team in home runs before his broken thumb injury in May, now may be out for the season with another freak injury. After Belt came off the disabled list in July, more weirdness happened for the Giants two weeks later. Belt re-injured himself during batting practice when Marco Scutaro hit him in the face on a throw to first. Belt played for a couple innings in the game, had an RBI double, but had to come out after he complained of dizziness. Turns out, Belt had a concussion and has less than exciting news after seeing a specialist in Pittsburgh Tuesday. Belt did come back at the beginning of August but perhaps prematurely. According to a concussion specialist at the University of Pittsburgh Medical Center, the Giants' first baseman needs at least two-to-three weeks of rest before he can even resume baseball activity. And since concussions are not something players want to mess around with or try to play through (think Mike Matheny), there is a strong possibility the Giants may want to be extra cautious and give Belt more time than that--perhaps the rest of the season. Given the seriousness of concussions and Belt's value to the Giants, it would not be wise to rush him for one season. The Giants do not exactly have a major-league ready backup plan in the minor leagues, and they need to make sure Belt is ready for 2015 and beyond. So, the Giants need to be 150 percent sure Belt's concussion has passed before putting their possible future All-Star first baseman back on the field. For now, Travis Ishikawa and Adam Duvall will have to pick up the slack in Belt's absence, and one of those players shined at Wrigley Field Wednesday night. Even with all the weirdness this season, where the Giants have looked like the worst team in baseball for about two months, the Giants are just three games behind the Los Angeles Dodgers in the National League West and 1.5 games up on the second Wild Card spot. 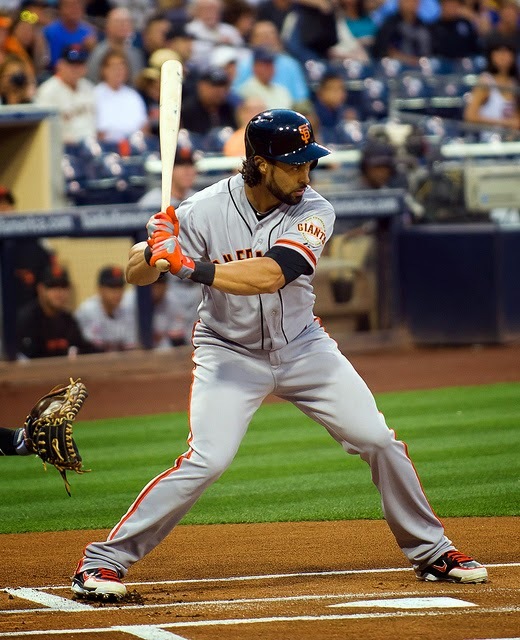 The San Francisco Giants were anticipating leadoff hitter Angel Pagan's return from the disabled list for weeks--and with good reason. Although the Giants are 1-5 since his return from a back injury, Pagan was the difference in Wednesday's 7-1 win over the Chicago White Sox. He served a sinking 94-mph fastball the opposite way for a bases-loaded, two-run single that gave the Giants a 3-1 lead in their seven-run, seventh-inning rally. Disciplined plate approaches like Pagan had in the seventh inning is what most of the Giants' hitters have not been doing in key situations. Instead of overswinging on the Ronald Belisario outside fastball and rolling it over into a ground-ball out, or whiffing at the pitch, he hit a solid line drive. It's good at-bats like this the Giants hope to see again at the top of the order to get the offense going in front of sellout crowds at AT&T Park. Line drives can be contagious, and they are one virus the Giants hope to catch--instead of the crud. The numbers suggest Pagan has been putting up similar quality plate appearances at home. In 127 at-bats at home, he is hitting .323, with a .360 on-base percentage and an above-average OPS of .778. But throwing the numbers out the window, it is those not trying to do too much at-bats that succeed at the Giants' expansive home ballpark. Even if a long swing makes enough contact for a deep fly ball, there is a very good chance it will find a glove. Pagan's ability to spray the ball to all fields, take the extra base, and steal some bases should help the Giants start more rallies at home--and get the sellout crowds into the game. Children playing hooky from school to catch an Opening Day baseball game could be a thing of the past if Budweiser has its way. Budweiser, the official beer of Major League Baseball, said it wants to make Opening Day a national holiday. The beer company said in a YouTube video it has received more than 100,000 signatures, enough to get a formal response from the White House. "The White House has heard us," former St. Louis Cardinal Shortstop and spokesman for the campaign Ozzie Smith said in the video. "Let's make Opening Day a holiday." Other retired players and former managers are joining Smith in Budweiser's "Make Opening Day a Holiday" campaign, a Budweiser spokesman said. Budweiser has released a video on its YouTube page with former baseball players talking about what Opening Day means to them. Among those supporters are former Oakland Athletic Eric Byrnes and former Cincinnati Red Sean Casey. It is fitting that a Red is featured in a YouTube video because for many years, the first pitch of the season was traditionally in Cincinnati. Budweiser is not stopping there. 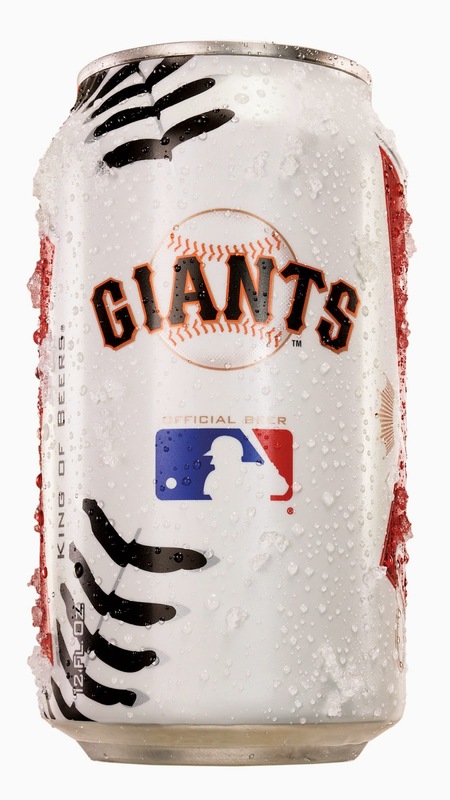 They are also releasing a limited-edition San Francisco Giants Budweiser can, one of 23 MLB teams featured. Bruce Bochy: San Francisco Giants Second Baseman Marco Scutaro "days away from live BP"
Marco Scutaro at the Giants 2012 World Series Parade. 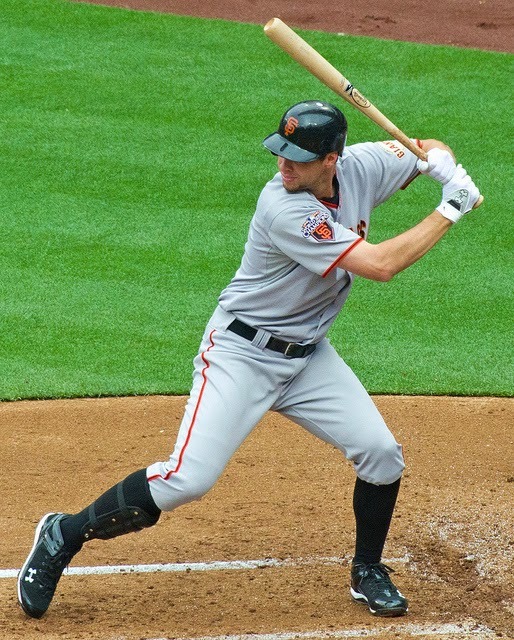 San Francisco Giants second baseman Marco Scutaro's return to full baseball activity has been pushed back for at least another week, according to Comcast SportsNet Bay Area. The Giants originally planned for Scutaro to play this weekend, but Bruce Bochy told CSN Bay Area that will not happen. In fact, Bochy acknowledged the club might have to make alternative plans for Opening Day if Scutaro is not ready to play soon. “If you ask me at the end of next week and he’s not playing or close to playing, we’ll have to have another plan here,” Bochy said after Friday's 5-0 win over the Kansas City Royals. 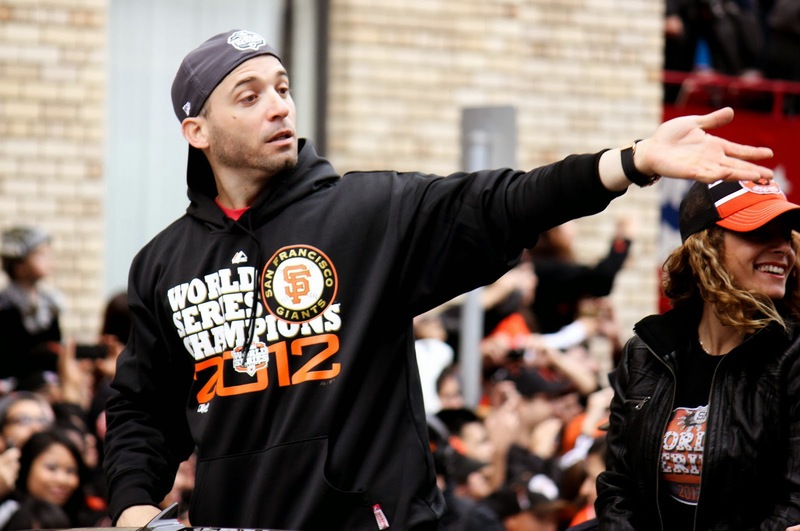 The Giants planned to limit Scutaro's spring training anyway as he recovers from chronic back and hip issues which hampered him last year, but Bochy said he would like Scutaro to get at least 30 to 35 at-bats before the season starts. As the calendar turns towards April with no Scutaro playing in exhibition games, the likelihood of him starting at second base on March 31 in Arizona is becoming less and less. Joaquin Arias or Tony Abreu would probably get the nod on Opening Day if Scutaro is not ready to go, although infielder Ehire Adrianza has opened some eyes in the infield this spring. But don't tell Scutaro he won't be ready when the bell rings. He told John Shea of the San Francisco Chronicle Friday he will be ready for Opening Day because he has seen improvement with his back. And his bat would be hard to replace in the second spot of the batting order. Scutaro hit .297 with a .357 OBP last season in 127 games, playing many of those games with an injured finger. The good news, as Scutaro told the Chronicle, is there's still three weeks left in the Cactus League season. If Scutaro is not close to returning by this time next week, Brian Sabean may need to explore adding more depth to the position via trade. The Mailbag is open. Contact me with your questions. Questions? Comments? Feedback? E-mail my blog mailbag at vc4re@yahoo.com. Your question may be posted on my blog, along with answers. Check out my Bleacher Report profile. Help out by leaving a comment! Theme images by tacojim. Powered by Blogger.